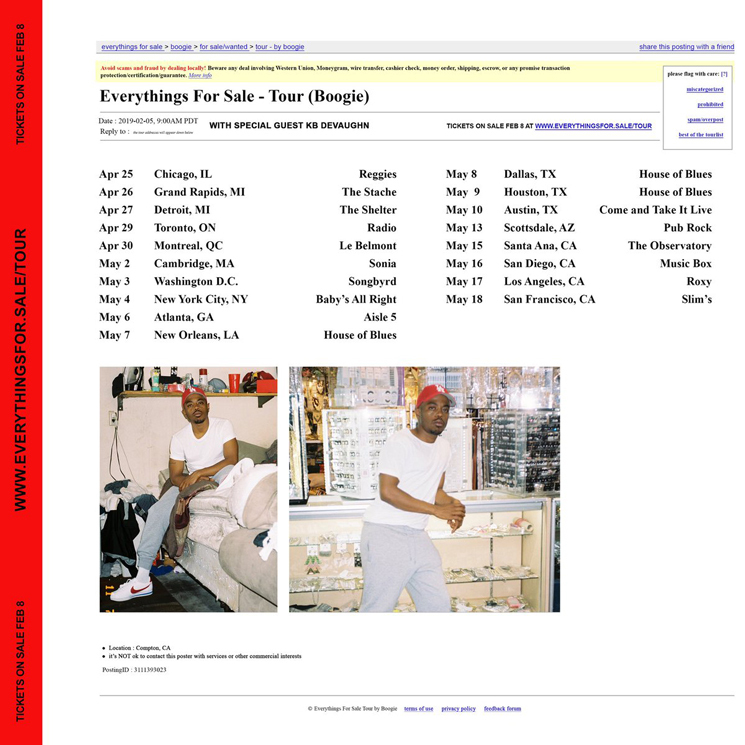 Weeks removed from delivering his Everything's for Sale album, Compton rapper Boogie has announced his first-ever headlining tour behind the record. The 18-date run will kick off in April and includes a pair of Canadian stops early on. Boogie will first play Toronto's Radio (f.k.a. Adelaide Hall) on April 29 before playing Montreal's Le Belmont the following evening on April 30. You can find a complete tour itinerary below. Support on the run will come from fellow Californian KB Devaughn. Tickets for all dates go on sale this Friday (February 8) through Boogie's official website. Everything's for Sale is out now through Shady Records/Interscope and features Eminem, 6LACK, J.I.D, Christian Scott aTunde Adjuah and Snoh Aalegra.